Is Delhi really 100 year old? Delhi, the capital of Republic of India. It is said that Delhi has completed its hundred years on 12th December 2011. How true is this statement? What happened 100 years ago? 11th December, 1911 – King George V was declared the Emperor of India and on 12th December 1911, he presented himself to the public at the Coronation Ground in Burari Village, Delhi. This ceremony was called ‘Delhi Durbar’. On this occasion, King George declared that the capital of British India be shifted from Calcutta (now Kolkata) to Delhi. 12th December 2011, we complete 100 years of this declaration. 1321-1398 Tughlaq Dynasty Ruled from Areas like Tughlaqabad, Jahanpanah (now Begumpur, Sarvpriya Vihar and Tara Apartments etc.) and Ferozabad (or Feroz Shah Kotla). NOTE: Muhammed bin tughlaq took capital from Delhi to Daultabad for some time, but brought it back. 1556-1857 Mughal Dynasty Akbar and Jahangir took Capital out of Delhi but Shahjahan bought back to Shahjahanbad and started rule from Red Fort of Delhi. 1856-1947 British After taking last Mughal king out in 1857, British continued to rule from their existing setup in Calcutta. Then King George V, on 12th December 1911, declared to bring the capital back to Delhi. We have numerous sites and remains since 7th century showing Delhi as one of the most important cities of India. British just understood the importance a little late and utilized the empty space lying between the other 7 cities of Delhi. The did a unification of cities and restored few old buildings. After the declaration in 1911, it took more than a decade for the capital to actually move in. The Viceroy House (Rashtrapati Bhavan) was commissioned on January 23rd, 1931. 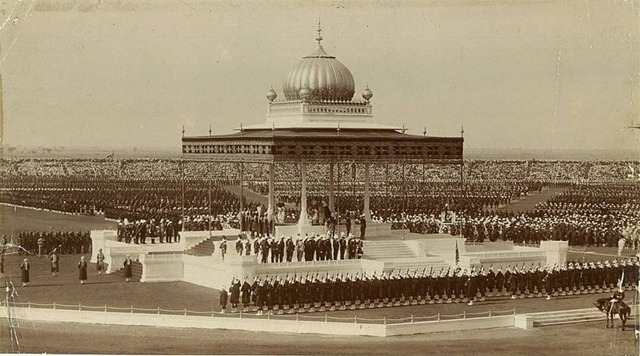 Following is the video from the Delhi Durbar of 1911 at the Coronation Ground of Delhi. Rest is up to you to decide.